Earlier this month Doug Armstrong, from Grand Rapids Mi, sent in this question to the Sales-Training-Sales-Tips website. This is a great question on a sales objection that I know many of us come up against when trying to close a sale. 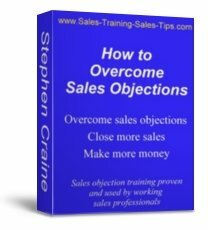 There is no one answer that will overcome this or any other sales objection. When a prospect raises a sales objection it is very rare that they are giving you enough information to really overcome that objection. They think they should get other quotes because that's what people are supposed to do when buying something. A business customer might have a buying strategy or a company process that includes getting a set number of quotes. The prospect has some reservations but don't want to tell you directly so they raise a smoke screen objection. And there are many more possible real objections behind the same words. So the same objection can mean as many different things as the number of people that raise it. The best way to answer the objection is to find the true objection behind it. The objection of ‘I need more quotes from other suppliers,’ will be based around the buyer's strategy for making a decision to buy. The process they will follow to decide which product to buy and who from. So a really good question is to ask them how they are going to make their decision. What process will they follow and what are the reasons for using that process. A direct sale to home owners usually means the way a prospect approaches decisions on buying can be changed. The process that they use is their choice, consciously or sub consciously, and not a mandatory rule as you sometimes get with corporate buyers. That's a main difference between Direct Sales and B2B selling. A common buying strategy for direct sales customers is that having 3 alternatives to choose from is an effective way to make a buying decision. The prospect takes this belief and adds to it the logical step of getting the 3 alternatives from 3 different suppliers. If, after questioning to discover the real objection, you find that this is why the prospect wants 3 quotes you can then work on overcoming the objection. What if you gave the prospect 3 alternatives? 3 different options, with 3 different prices, and a choice that matches their buying process. It fulfils the needs that they highlighted they have when they raised the sales objection. The need to se 3 different options and 3 quotes. Add to your presentation that the options you are offering give them everything that they would get if they went to all the trouble and inconvenience of obtaining quotes from other companies.